Our valuation services are the cornerstone of a service offering and something we’ve built a reputation of quality for nationally. We regularly undertake valuations for the purposes of mortgage security, litigation, compensation, acquisition and trust reporting. We work in the review of statutory assessments and appeals. This includes assisting clients, pursuing objections and projecting statutory outgoings for existing assets, potential acquisitions and new developments. The foundational nature of the property industry here in Australia underpins the security of a number of industries and the impact of positive decision-making can ensure our clients protect their wealth, while focusing on their future. m3property carry a responsibility on behalf of authorities, claimants and individuals to give objective and conflict-free advice to the project or individual(s) in question, across a breadth of property types in Australia. The property industry has a habit of keeping our eyes on the horizon. Our research arm provides our clients, as well as our advisory services, with additional clarity suited to their needs. Insights from our research team on sector-specific trends, highlighting sales, yields and market outlook to help you make better, more informed decisions. Detailed research on property trends across Australia. Exploring the trends and changes that affect a variety of specific areas of interest for professionals in the property sector. For over 30 years, we’ve built trusting relationships on the back of expert, independent property advice that looks beyond the immediate; seeing things strategically and striving for excellence in what we do. As one of Australia’s most reputable property valuation firms, our people can build confident careers in property that provides our clients with a relationship they can rely on. Our directors work locally to serve the needs of each client and collaboratively at a national level to ensure M3property remains objective, focused and driven to embrace change. 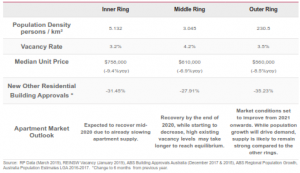 Sydney Residential Development m3property Insight - Sydney’s apartment market and what lies ahead? 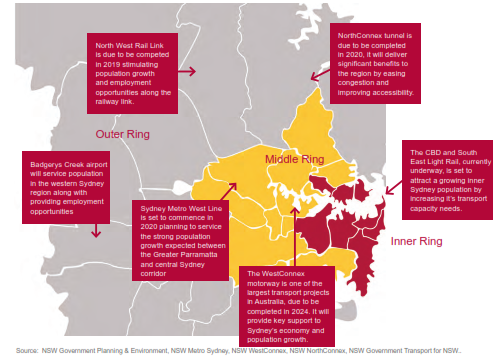 Sydney’s apartment market and what lies ahead? Oversupply of apartments launched in 2017 and completing over 2018 and 2019. Vacancy exacerbated by subdivision and greenfield development as well as infill apartment development, despite continued strong population growth. Solid population growth, improved housing affordability and increasing wages growth should see demand strengthen and reduced apartment completions over 2019 and 2020 should see the imbalance between supply and demand turn back towards an undersupply of dwellings by mid to late 2020. This should result in falling vacancy and rising unit prices in 2020 and 2021.